In Egypt the Nile River Valley conceals a massive canyon that once was as deep and wide as the Grand Canyon in Arizona. We have explored the origins of this lost canyon in the past three posts. We found that geologists have described the origins of the canyon itself at the time of the Messinian Salinity Crises just over 5 million years ago. Further studies suggest that it took some four million years for the Nile Valley canyon to be filled with sediments from input from the Nile River and that the Nile Valley has probably looked like it does today for the past one million years though the Nile River has experienced many changes in volume over that time. These values are unacceptable to young earth creationists (YECs) who confine all the geological features of the Earth to no more than 6000 years of age. Could the Nile Valley have been part of God’s original creation according to YECs? No! This is because Noah’s Flood 4350 years ago would have obliterated any river that existed prior to that time and the canyon cuts through layers of fossiliferous rock which YECs are convinced could not have existed in the original “good” creation. Therefore the Nile River Valley and the canyon that is buried beneath it are at most 4350 years old having been either formed during the year of the Flood or soon afterwards. How can the young-earth believer accommodate the evidence of this historical canyon? Before we attempt to answer that question there is some more evidence that puts constraints on that young-earth explanation that we must explore. We might first ask, how long has the Nile Valley appeared as it does today? I think we can say with great confidence that it has changed little in appearance in recorded human history. The Egyptians have lived along its banks – ie. on top of the buried canyon – for thousands of years. There are archaeological sites in the Nile Valley that predate the Egyptians. Sites with stone tools are common in sediments below those that are certainly Egyptian in origin. Even in the stories of their own history, Egyptians have believed the Nile Valley has always existed. There are no eye-witness historical accounts that suggests the Nile Valley has appeared any different from today beyond the changing pattern of the meandering river. At a minimum, we can conclude that Nile Valley has been full of sediments with a Nile River meandering through it for all of human history. Young earth creationists such as Ken Ham, have developed a chronology of human dispersal in which Noah and his family disembarked from an Ark 4350 years ago. About 100 years later all humanity gathered at the city of Babel, presumably near the Euphrates River, to construct a great tower. But God created confusion among the people causing them to scatter across the Earth. This dispersal then represents the oldest date – 4250 years ago – for any people group living anywhere in the world (eg. Native Americans, Tasmanians, Chinese etc. are no older than this date). Presumably some people migrated from Babel to the Nile Valley and became the Egyptian civilization. This chronology is in stark contrast with all Egyptian scholars who place the origins of the Egyptian civilization at least a 1000 years older than the YEC timeline will allow. And this does not include the evidence of nomadic people living in Egypt well before the Egyptians (Billions of Stone Artifacts: Witness to the Ancient Occupation of the Saharan Desert). What can we learn from the Bible about the history of the Nile River? We know that Abraham, during a time of famine in the region of Palestine, traveled to Egypt to save his family. There he came to the Nile Valley and found a thriving civilization ruled by a Pharaoh. So we can be certain that the Nile Valley canyon was completely filled with sediments 200 years after Noah’s flood according to the YEC timeline. Furthermore, for the Egyptian civilization to have become well-established prior to Abraham’s arrival would have required significant time. In the YEC timeline this is impossible since the Egyptians civilization could only have developed after the dispersal from Babel which, according to their timeline, occurred not more than 50 years before Abraham’s birth. Regardless, there is no doubt that the Nile Canyon was no where to be seen by those that first migrated to the region. This Guy Billout cartoon, first published in The Atlantic Monthly shows the scene at the Rock of Gibraltar 5.33 million years ago. It depicts the catastrophic flood that ended the Messinian salinity crisis when Atlantic waters re-entered the Mediterranean. Did the Nile Valley canyon form during the Flood? We have already established that the Nile Valley canyon is an incision made deep into fossil bearing sedimentary rock and granite. YEC insist that the Noah’s Flood created all fossil-bearing sedimentary rocks. But if the rock that the canyon is eroded out of what was formed during the Flood how could the Flood, which covered the whole Earth erode a massive canyon at the same time? The incision deep into granite and well below sea level would be impossible – baring miraculous intervention – to produce while under water. And it would fail to explain the massive salt deposits that lie below the Mediterranean Sea. Furthermore, the sedimentary rock that has filled the canyon today is exactly the type of sedimentary rock that would form in a standing lake. What’s more, analyses of sediments from the Nile delta reveal that the source of the sediment in the delta has changed over time as the sources of water to the Nile have changed due to climatic and geological changes to northern Africa. How could a global flood fill a canyon with sediments that can be specifically identified as coming from specific post-flood geographic regions? A flood model of the Nile canyon formation makes no sense and is not supported by any observations. A YEC approach to the Nile Valley canyon? So what is the YEC explanation for the buried Grand Canyon of the Nile? I am not certain. Why? Because even a brief mention of the Messinian Salinity Crisis is exceedingly rare in the YEC literature and the Nile Valley canyon has never been acknowledged – that I can determine – despite being a well-known geological formation. One would not expect true evaporites to form in the Flood, but the idea of precipitating the chemicals out is likely. The details of the formation of such huge precipitites need work. Creationists need a major research project, not only on the Messinian precipitites, but also on many of the other monstrous precipitites in the sedimentary rocks. Since the scale of the deposits is so large, it seems unthinkable that the precipitites could be post-Flood. Oard recognizes that there is not enough time for all those salt deposits to form by evaporation after the Flood and so once again another geological formation is shoved into the Flood year. I have shown before this simply doesn’t work in a similar location where thousands of feet of salts lie underneath the Dead Sea (Origins of the Dead Sea: All Dried Up – No room for a Dry Dead Sea in the Young Earth Paradigm). If Oard is right that the Mediterranean Sea never dried up then how did a canyon that empties into the Mediterranean basin and reaches over 6000 feet below sea level form? Why are there buried canyons all around the Mediterranean Sea in addition to the Nile canyon? Why is the Mediterranean Sea rimmed with gypsum and salt deposits when other oceans are not? These observations are not addressed by Oard nor in any other YEC literature that I am aware of. The Grand Canyon in Arizona provides irreconcilable problems for the young earth paradigm (The Grand Canyon: Magnificent Witness to Earth’s History). YECs have spent considerable effort trying to explain how the Grand Canyon could have been created within a very short period of time. All of those efforts focus on providing naturalistic mechanisms operating in the post-Flood world. They say that a huge lake above the current Grand Canyon experiences a catastrophic breach causing the erosion of the Grand Canyon in a matter of days or weeks. In contrast to this attempt to place the carving of the Grand Canyon into the history following a global flood, YECs cannot use the same post-flood explanations for the origins of the Grand Canyon of the Nile Valley. Rather it seems they will be forced to place the formation of the canyon into the short history of the Flood itself despite the obvious difficulties that will cause. The Nile Valley’s buried canyon isn’t the only problem for the YEC view of biblical chronology. Their own speculations about a “biblical” Ice Age just 4000 years ago cause additional problems. In the YEC timeline a singular Ice Age occurred soon after the global flood reaching its maximum stages soon after the tower of Babel event. What would the Nile River have looked like at the time the first Egyptians were taking up residence along the Nile just after Babel? It would not have looked like it does today! The YEC timeline requires massive ice loss in a just a few hundred years. They also propose the Saharah was green at this time and thus far more water was available to the Nile River. As a result the Nile River would have been a raging torrent during this time. There would hardly have been the regular cycles of high and lower water that the Egyptians relied on for centuries. Studies of the Nile River delta show that there are massive sediments buried there that are associated with Ice Age melting in the Africa highlands but those sediments were laid down before human habitation of the Nile Valley occurred. This contradicts the YEC prediction. YECs believe Abraham lived in the waning years of the Ice Age and thus when he would have arrived at the Nile River at a time when it was a rushing torrent and no one could live in the Nile Valley but rather would have been restricted to the desert above the valley floor. This is not the description that we find in the Bible. Nothing in the scriptures suggests that the Nile Valley was any different from today. Ironically the eye-witness testimony of the scriptures is something that YECs appear to avoid using to test their own theories. How should we understand the history of the Nile Valley and Biblical Chronology? I believe the simplest and most consistent answer is that Abraham came to the edge of the Nile Valley and was met with the scene that looks much as it does today. I have no problem with the theory that the Messenian Salinity Crisis is the physical causative agent of the origin of the Nile River. I would say that God is the first cause and the processes of evaporation and erosion are His means of creation. As such those means are the ones we can study and describe. Long before Abraham, Noah or even Adam and Eve walked on this Earth, the Nile Valley canyon was formed and then filled with sediments. The first people to set up camp on its shores saw a Nile River just as we see it today. All of the events recorded in the scriptures take place after the Nile River came to be as we see it today. Genesis 1 tell us about in broad brush fashion that God formed the heavens in the Earth but then the text turns its attention to the story of Man and is not concerned about the specifics of how old particular geological formation are or how they were formed. There is no need to find a place in human history for this lost Grand Canyon. It isn’t a problem to be solved but it is something to be explored as a part of God’s creation. *An “impossible” task? By this I mean that without invoking multiple miracles and numerous ad-hoc unparsimonious the evidence of a canyon below the Nile River Valley precludes the young-earth view. Abdelkareem, Mohamed, and Farouk El-Baz. “Remote sensing of paleodrainage systems west of the Nile River, Egypt.” Geocarto International(2016): 1-15. Abdelkareem, Mohamed, Eman Ghoneim, Farouk El-Baz, and Mohamed Askalany. “New insight on paleoriver development in the Nile basin of the eastern Sahara.” Journal of African Earth Sciences 62, no. 1 (2012): 35-40. Castañeda, Isla S., Stefan Schouten, Jürgen Pätzold, Friedrich Lucassen, Simone Kasemann, Holger Kuhlmann, and Enno Schefuß. “Hydroclimate variability in the Nile River Basin during the past 28,000 years.” Earth and Planetary Science Letters 438 (2016): 47-56. Duggen, Svend, Kaj Hoernle, Paul Van Den Bogaard, Lars Rüpke, and Jason Phipps Morgan. “Deep roots of the Messinian salinity crisis.” Nature 422, no. 6932 (2003): 602-606. Fauquette, Séverine, Jean-Pierre Suc, Adele Bertini, Speranta-Maria Popescu, Sophie Warny, Naïma Bachiri Taoufiq, Maria-Jesus Perez Villa et al. “How much did climate force the Messinian salinity crisis? Quantified climatic conditions from pollen records in the Mediterranean region.”Palaeogeography, Palaeoclimatology, Palaeoecology 238, no. 1 (2006): 281-301. Garcia-Castellanos, Daniel, Ferran Estrada, Ivone Jiménez-Munt, Christian Gorini, Manel Fernández, Jaume Vergés, and R. De Vicente. “Catastrophic flood of the Mediterranean after the Messinian salinity crisis.” Nature 462, no. 7274 (2009): 778-781. Hsü, Kenneth J., Lucien Montadert, Daniel Bernoulli, Maria Bianca Cita, Albert Erickson, Robert E. Garrison, Robert B. Kidd, Frederic Mèlierés, Carla Müller, and Ramil Wright. “History of the Med Hsü, K. J., W. B. F. Ryan, and M. B. Cita. “Late Miocene desiccation of the Mediterranean.” Nature 242, no. 5395 (1973): 240-244. ISSAWI, Bahay. “PALEOHISTORY OF THE NILE RIVER.” In 2002 Denver Annual Meeting. 2002. Judd, John W. “Report on a series of specimens of the deposits of the Nile Delta, obtained by the recent boring operations.” Proceedings of the Royal Society of London 39, no. 239-241 (1885): 213-227. Koopman, Annelies, Sjoerd Kluiving, Simon Holdaway, and Willeke Wendrich. “The effects of Holocene landscape changes on the formation of the archaeological record in the Fayum Basin, Egypt.” Geoarchaeology 31, no. 1 (2016): 17-33. Krijgsman, W., F. J. Hilgen, I. Raffi, F. J. Sierro, and D. S. Wilson. “Chronology, causes and progression of the Messinian salinity crisis.”Nature 400, no. 6745 (1999): 652-655. Müller, Daniel W., and Paul A. Mueller. “Origin and age of the Mediterranean Messinian evaporites: implications from Sr isotopes.” Earth and Planetary Science Letters 107, no. 1 (1991): 1-12. Nesteroff, W. D., and France VI. “21. MINERALOGY, PETROGRAPHY, DISTRIBUTION, AND ORIGIN OF THE MESSINIAN MEDITERRANEAN EVAPORITES.” Initial Reports of the Deep Sea Drilling Project: A Project Planned by and Carried Out with the Advice of the Joint Oceanographic Institutions for Deep Earth Sampling 13 (1973): 673. Revel, Marie, E. Ducassou, C. Skonieczny, C. Colin, L. Bastian, D. Bosch, S. Migeon, and J. Mascle. “20,000 years of Nile River dynamics and environmental changes in the Nile catchment area as inferred from Nile upper continental slope sediments.” Quaternary Science Reviews 130 (2015): 200-221. Rouchy, Jean Marie, and Antonio Caruso. “The Messinian salinity crisis in the Mediterranean basin: a reassessment of the data and an integrated scenario.” Sedimentary Geology 188 (2006): 35-67. Rzóska, Julian. “The Geological Evolution of the River Nile in Egypt.” In The Nile, Biology of an Ancient River, pp. 2-4. Springer Netherlands, 1976. Said, Rushdi. The geological evolution of the River Nile. Springer Science & Business Media, 2012. Srikantia, S. V. “Geological Evolution of the Mediterranean Basin.”Geological Society of India 31, no. 1 (1988): 176-177. Woodward, Jamie, Mark Macklin, Laura Fielding, Ian Millar, Neal Spencer, Derek Welsby, and Martin Williams. “Shifting sediment sources in the world’s longest river: a strontium isotope record for the Holocene Nile.” Quaternary Science Reviews 130 (2015): 124-140. Woodward, J. C., M. A. J. Williams, E. Garzanti, M. G. Macklin, and N. Marriner. “From source to sink: Exploring the Quaternary history of the Nile.”Quaternary Science Reviews 130 (2015): 3-8. Woodward, Jamie C., Mark G. Macklin, Michael D. Krom, and Martin AJ Williams. “The Nile: evolution, Quaternary river environments and material fluxes.” Large rivers: geomorphology and management 13 (2007): 712. 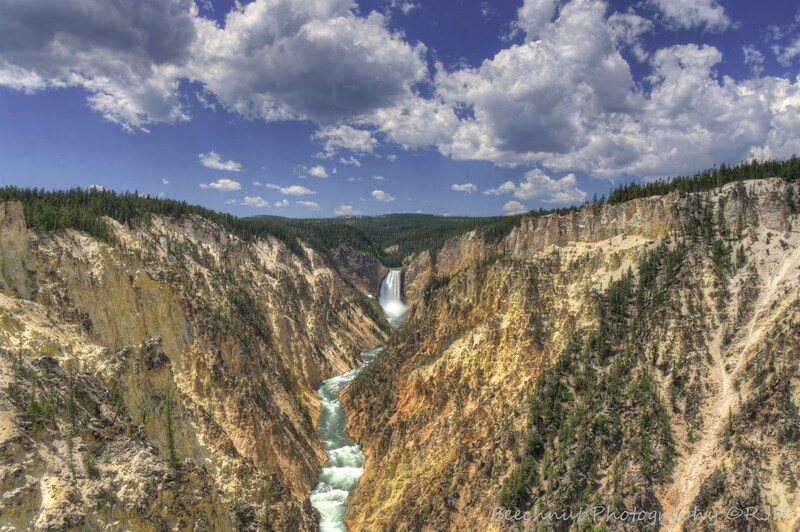 Cover Image (below) is Yellowstone Falls in Wyoming. I took this picture on our recent trip to Yellowstone National Park (June 2016). Yellowstone Falls in Yellowstone National Park in Wyoming. Photo: Joel Duff, June 2016. I really enjoyed this series. I’m surprised there haven’t been more comments on it. If any of the YEC organizations ever deign to comment on this issue, I’d be interested to see what they say. I recently read the new book “THE GRAND CANYON MONUMENT TO AN ANCIENT EARTH” the geological history of the Nile is even more persuasive of an ancient earth. Unfortunately when you get into the real science you lose most YEC because they really don’t care about any science that doesnt include a global flood as the standard explanation. I am an ex YEC and even held on to that world view after graduating from Stanford with a major in Human biology- A major lead by some a the most well known experts in evolution at that time (1977-81). I am embarrassed to say I got much of my arguments from Kent Hovind. (I have repented). Having said that, I want the author of this series to continue posting these scientifically accurate posts on our panets geological history. Lack of responses is irrelevant. I for one have never had exposure to the geological hx of the nile. Its another evidence that the YEC leaders will someday have to defend. I am just hoping that with time my very good christian friends will realize that this insistence that the bible demands a 6000 year old earth/universe will fade away and the divisiveness will turn to unity. Thanks for the post. If it only impacts a few it is worth it.